Shakespeare added over 1,000 words to the English language such as Addiction, Bedazzled, Cold-blooded, Swagger, etc. The words that remain the same when turned upside down are called Ambigrams, e.g. Swims. Isogram is a word or phrase in which each letter appears the same number of times. For example, ‘dialogue’ uses each letter once. 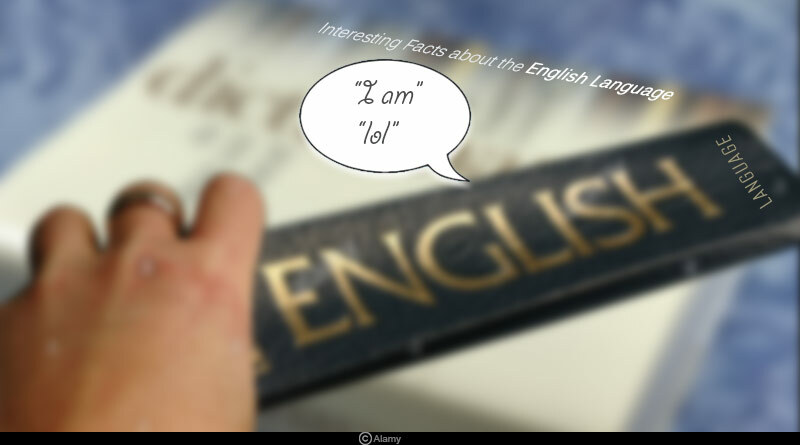 The word ‘lol’ was included in the Oxford English Dictionary in 2011. The longest word in the English dictionary is ‘Pneumonoultramicroscopicsilicovolcanokoniosis’ which has 45 letters. The word means a type of lung disease caused by inhaling the dust. Earlier the longest word was Supercalifragilisticexpialidocious. Many English words have changed their meaning over time – for example, ‘awful’ earlier meant ‘inspiring wonder’ and was a short version of “full of awe, whereas ‘nice’ was used as a term for ‘silly’ or ‘foolish’ in the 14th century. The first ever English dictionary was written in 1755. ‘Town’ is the oldest English word which is still used by everyone. Each year around 4000 words are added to the English dictionary. Any mark, point, or sign added or attached to a letter or character to distinguish it from another of similar form, to give it a particular phonetic value, to indicate stress, etc., is called a diacritical mark. The dot diacritical mark placed over I and J when written in the small alphabet (i, j) is called ‘tittle’. A sentence that contains every letter in the language is called Pangram. In English, it is “The quick brown fox jumps over the lazy dog”. “I” is the shortest and oldest English word. The most used English words are “I” and “you”. The Words we commonly use even though they add no meaning or value to the sentence are called Crutch words. For example, I was like, OMG, etc. Actually, honestly, basically, are commonly used as crutch words. The word “Set” has the most number of definitions of any word in the English language. It has 464 definitions in the Oxford English Dictionary. ‘Pronunciation’ is the most mispronounced word in the English language. ‘oh’, and ‘happy’ are used 3 times more often than the word ‘sad’. Hydroxyzine is the only English word which has letters X, Y, and Z in order. It is a type of preventive medicine for sneezing and anxiety. Letter “b” will not be used until “billion” if you write down all the numbers (e.g. one, two, three . . ). ‘E’ is the most commonly used letter in the English language and 11% of the entire English language is just letter E.
English is the most widely learned second language and is either the official language or one of the official languages in around 60 sovereign states. For more articles like ‘Some amazing facts about the English Language, do follow us on Facebook, Twitter, and Instagram.